Hurricane Irene has been downgraded to a tropical storm. It doesn't look bad in New York City, but police are still advising people to stay indoors. Flooding is still a danger. Anderson Cooper is reporting from Battery Park. It wouldn't be a hurricane without him. There was a segment with a group of very feisty women in a senior's home in Atlantic City saying they weren't going anywhere. Gov. Christie said they could only get 100 to leave, 500 simply refused. So far they are okay. 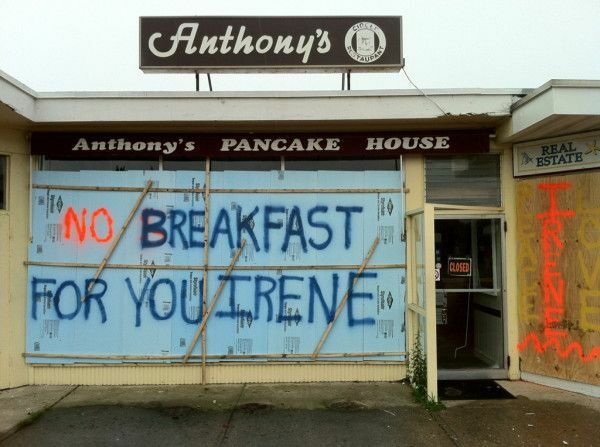 Hurricane Irene has reached New York. Mayor Bloomberg says it's too late to evacuate, just stay indoors. Here's the current tracker. For those of you on the east coast, how are you doing? The New York Times has this easy to follow graphic Hurricane Irene Tracker where you can follow the storm's progress, estimate the time it will hit various places, and at what strength. Washington, DC is slated to greet Irene at 8 am Saturday morning. President Obama is leaving Martha's Vineyard a day early. 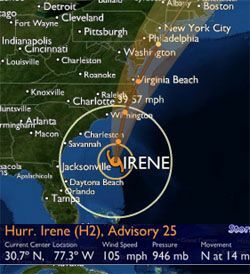 In North Carolina, Irene has been downgraded to a Cat 2. A lot of power outages are expected. What are you doing to prepare? What online sites are you following for updates? The National Hurricane Center is here. And will there be any other news to follow over the next few days?